Light food, tea/coffee & soft drinks will be provided. Alcohol & more 'substantial' food will be available but at your own expense ! The 10th Anniversary Flavours Gala will take place this year on Thursday 4th October 2018 at the Sheraton Hotel, Warsaw. As ever, the annual dinner will consist of a specially-prepared menu comprising Irish-sourced food and drink. The event will commence at 7pm. 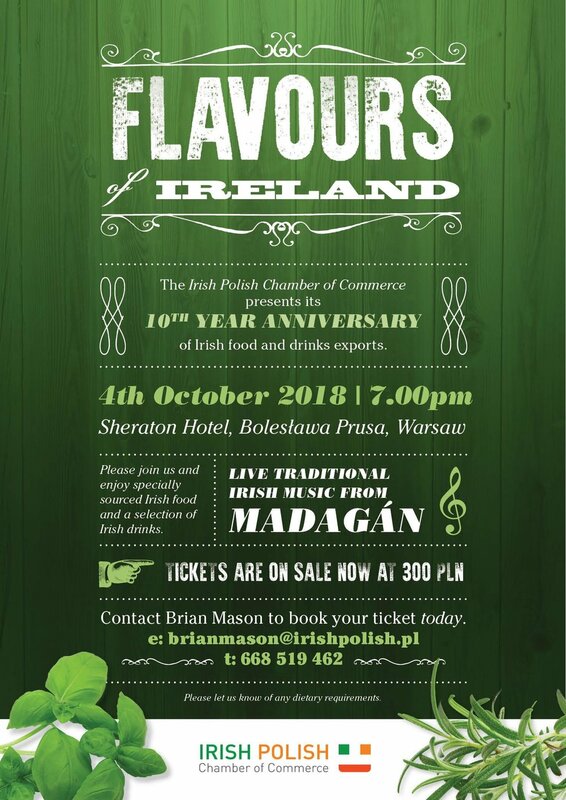 In addition to the famously delicious dinner, a selection of Irish whiskeys, and other alcoholic and non-alcoholic beverages, the 10th anniversary of Flavours will be enhanced with entertainment to be provided by Madagan, Northern Ireland, and one of Ireland's, premier traditional music groups. As ever, this will be the perfect occasion to mix clients and friends to celebrate our fine Irish food and drink! The Board of the Irish Polish Chamber of Commerce informs you that the Annual General Meeting of the Irish Polish Chamber of Commerce will take place on Tuesday September 18, 2018 at 6:00 PM at the Residence of the Ambassador of Ireland. You are most cordially invited to attend and new members will be most welcome. The meeting will be followed by a buffet dinner reception. You’re very welcome to join us for the 3rd Irish Polish Innovation Forum - Accessing Capital and Global Markets. The event will take place on 12th June in Startberry, as a part of the Irish trade mission to Warsaw, led by Pat Breen, minister of State for Trade, Employment, Business, EU Digital Single Market and Data Protection. Among the speakers we will have Michał Sikorski from Huggity who have recently been hired by CNN to provide a Gigapixel Fanpic service from the Royal Wedding. Huggity’s next project is at the World Cup in Russia. Their previous brands activation projects include the Olympics in Brazil, Rugby World Cup in the UK and Formula 1 races. Representative of Irish Breeze will talk about the company’s global expansion in the context of Waterwipes, their hugely successful product in dozens of countries including Poland. In total we will have 6 Irish and Polish case studies of startups and scaleups from sectors such as e-commerce, health & beauty, B2B software to demonstrate similarities and differences in the two tech ecosystems and highlight areas for co-operation. The event will bring together representatives of entrepreneurial community in Warsaw, Polish & Irish enterprise agencies, organizations involved in fostering innovation, and the Irish-Polish business community. The Forum is organized by Enterprise Ireland, Irish Government’s enterprise agency, in association with the Embassy of Ireland and Startberry, technology accelerator founded by Microsoft, EY and Senfino. St Patrick’s Day is celebrated by millions worldwide. Rivers and buildings turn green, parades take over cities and all these events are a joyful celebration of Irish culture, music, food and drink. As an appreciation of your contribution to the development of Irish-Polish business in Poland; Enterprise Ireland and the Irish Polish Chamber of Commerce would like to invite you to a St Patrick’s reception. Enterprise Ireland/Commercial Section of the Embassy of Ireland in Warsaw is organizing “Irish MedTech 2018” seminar. The purpose of the event is to present the most recent and innovative medical technologies developed in Ireland, with main focus on case studies, solutions and problems. We will be delighted to welcome you at the event and present to you the most innovative Irish companies and their products. After the event there will be a networking opportunity. The seminar is free of charge and will take place in the Google Campus in Warsaw on February 21st 2018. Ireland - hub for development of global MedTech. What elements build the competitive advantage of Irish medical companies? Trends in development and threats in the pharma sector. Are pharma companies prepared for new challenges to come? How to avoid airborne infections? The newest AnaConDa generation, including presentation of results from hospital trials, will be presented by Professor Peter Sackey from the Pharmacology Section for Anaesthesiology and Intensive Care at Karolinska Institute, Stockholm. AnaConDa (Anaesthetic Conserving Device) is an anaesthetic delivery system developed for the administration of volatile anaesthetics such as Isoflurane or Sevoflurane to invasively ventilated patients. It facilitates cost effective, simple and safe delivery of these volatile agents in the ICU without the need for complex equipment. Professor Peter Sackey will present the AnaConDa, samples of Clinical studies and his experience of using the device from a clinical perspective. This revolutionary device will soon be available in Poland. Optimisation of production processes in pharma and chemical industry with a software that identifies and measures issues with production causing delays in production schedules and increasing costs. By using e-ConnX companies can increase their productivity and reach production plans. · 2000 micromoments - what is the "digital user experience"? The Ambassador will host this breakfast meeting on Tuesday, October 17 from 08.30 – 10.00 at the Embassy of Ireland, ul Mysia 5, 6th floor. The Irish Polish Chamber of Commerce will take place on Thursday September 21, 2017 at 6:00 PM at the Residence of the Ambassador of Ireland.You are most cordially invited to attend. The conference is under the honorary patronage of the Ministry of Economic Development. in Poland: American, Austrian, Belgian, British, Canadian, Dutch, French, German, Irish, Italian, Portuguese, Scandinavian, Spanish and Swiss. The conference will be held in Polish and in English (translation will be provided). Participation in the conference is free of charge after advance registration and receipt of confirmation of your participation. Due to the limited number of places and high interest, we can accept only one representative from each company/institution. The registration on a first come first served basis. The Annual Family, IPCC / FISP Charity Céile will be held downstairs in Stixx (which is opposite the Hilton Hotel) on Sunday 18 December from 2-6pm. This year we are collecting mens' shoes & boots, and any warm sweaters preferably small to medium in size, for the Warsaw Homeless. All donations will be sent to Fr Lorek at Kościół św Antoniego Marii Zaccarii in Sadyba/Mokotow where there are shower and first aid facilities for the less fortunate. Dont forget to "bake your cake / bring the cake / win a cake"
The IPCC Annual Flavours of Ireland dinner of specially-sourced and prepared Irish food and drinks is being held in the Sheraton Hotel, Boleslawa Prusa, Warsaw on Wednesday 28 September. In addition to a truly delicious dinner, a selection of Irish whiskeys, and other alcoholic and non-alcoholic beverages, there will be a band playing traditional Irish music during the event. On Saturday 27 August, the Irish Polish Chamber of Commerce invites you to a free Irish music concert in Warsaw city centre. This is a free, three Irish music concert event soundcloud detail on the bands below. The IPCC & the Swedish section of the SPCC are holding a joint event to watch the Euro 16 match in Pub Lolek, Ul. Rokitnicka 20 on Monday 13 June. As kick off is 6pm, it may suit to bring along children, more than welcome. To gauge numbers for seats/food etc could you please send an email to brianmason@irishpolish.pl if you plan to attend. Hope you can make it with your inflatable hammer ! In the coming days the Sejm will likely decide on the draft anti-tax avoidance legislation which may be introduced as early as 1 July 2016. The proposed draft, if enacted, will give the Polish tax authorities almost unlimited powers to recharacterise transactions whose main purpose, they believe, is tax avoidance. This follows on from Panama, Luxleaks, Swissleaks etc but the rules can also work on a more prosaic level (such as in respect to self-employment rather than Umowa o pracę). The event costs 250 PLN net (price includes one-on-one consultations with tax advisors from other countries and lunch) and the number of places is limited. We expect the Polish Parliament to imminently implement wide ranging anti-tax avoidance provisions, drawing on experience of similar provisions which other countries have introduced in recent years. We will consider the proposed Polish provisions and compare with other countries’ experiences with their GAAR. BEPS Actions 7 and 15 introduce a much broader definition of the permanent establishment concept with the aim of taxing entities in a given jurisdiction in line with the activities performed and substance located in that jurisdiction. This will impact commissionaire and dependent agent structures which hitherto have reported minimal taxable profits in territories where they operate. We will update you on progress in implementing rules and revising tax treaties via the so-called multilateral instrument. Poland, in line with many other EU countries has implemented rules to block tax advantages arising from so-called hybrid mismatches (for example, where one jurisdiction allows a transaction as a taxable cost and the other does not recognise the same transaction as taxable income). New regulations also limit the possibility to reduce the tax base via interest deductions. We summarise the implementation of these regulations in key EU countries. Wide ranging transfer pricing reporting rules are being introduced effective from 2016 and 2017 which will require increasing cooperation between parents and subsidiaries to prepare and disclose information about inter-company transactions and support pricing with benchmarking analyses. We consider how corporations can streamline these obligations to spread the compliance burden between group entities. BEPS Action 8 aims to ensure that income from intangible property is recognised in the jurisdictions where value is actually created. We review new legislation in the EU restricting tax advantageous regimes involving “patent boxes” which allow income from intangibles to enjoy low rates of taxation. We consider rules limiting deductibility or treaty benefits associated with licence fees paid to licensors which do not create or are not beneficial owners of IP. Matthew O‘Shaughnessy has 23 years experience advising major companies on Polish and international tax matters. Matthew was born and educated in the UK and came to Poland in 1992, originally to work in PriceWaterhouse, Warsaw. In 2007 Matthew registered his own advisory business and has co-operated closely with major firms such as Ernst and Young. Matthew is a certified Polish Tax Adviser and possesses an MBA in International Business from City University Business School in London. International Tax Review recognised Matthew as a leading transfer pricing adviser in Poland. Ruben van Aarle, advises a variety of businesses, ranging from starters in the market (often Internet, IT, and technology-driven businesses) to internationally operating SMEs and publicly traded corporations. Ruben is keen on conceiving original tax solutions and thinking along with his clients in implementing the solutions efficiently. Ruben's out-of-the-box way of thinking, which is typical of all partners at Taxperience, clearly manifests itself in his advisory work. Ruben has been a member of the Dutch Association of Tax Lawyers since 1999. Denis specialises in taxation as applied to the financial markets and financing transactions. Denis is an expert on the taxation of institutions as well as products offered to companies. He has participated in the legal and tax arrangement of complex financial transactions. A tax attorney, he also provides assistance in the area of transfer pricing. He is a member of IFA. Kevin is a Managing Director in US National Tax office and Andersen’s Transfer Pricing leader. Kevin has over 27 years of professional experience and has led all major aspects of Transfer Pricing issues, including planning/feasibility analyses, IP migration/restructuring, cost-sharing, Advanced Pricing Agreements (APAs), audit defense/litigation and global transfer pricing documentation. Kevin has extensive experience serving clients in major industry sectors, including: media & entertainment, engineering & construction, apparel, retail consumer products, telecommunications/ networking, pharmaceuticals/ healthcare and software development/data systems. Adam, the Office Managing Director of the Andersen’s Silicon Valley office, has over 18 years of domestic and international tax experience serving clients from emerging growth companies to large multinational enterprises. He advises both publicly-held and private businesses in a variety of industries, including semiconductor, software, manufacturing, biotechnology, retail, media and real estate. Adam's primary tax and business practice areas include: accounting for income taxes, compensation and benefits tax planning, tax controversies, global mergers and acquisition planning, tax credits, including research and experimentation tax credits, tax compliance. Enterprise Ireland and the Irish Polish Chamber of Commerce invite you to celebrate Saint Patrick’s Day in the company of friends and colleagues! Dress Code: Business Casual. Try and wear something green! Pure Sky Club is located on the 22nd floor of the Skylight Tower in the heart of the city, next to Zlote Tarasy, the premier shopping center of downtown Warsaw. Niall in Tortilla factory is putting on a family day from 2pm with entertainment for the Kids form Rob the Magician & Lindsay Martell. Vistra are holding their annual event in Szara Kazimierz, 39 Szeroka St., Krakow on 10 March at 7pm. You are warmly invited to the next networking event organised by the Irish Polish Chamber of Commerce, which will be a blind tasting event with a number of special whiskeys (not only Irish, admittedly). To guide us through this mouth-watering adventure will be whiskey experts and as much craic as you will need to get through the remainder of the morbid Polish winter! Places are very limited, so please indicate if you are able to make it, so that the Chamber can allocate you your ticket! Tickets to this event are free of charge to IPCC members. We have great pleasure in inviting you to a breakfast briefing on the Polish economy. Mr. Maciej Reluga, Chief Economist at Bank Zachodni WBK S.A. has kindly agreed to give a presentation to the Chamber on the Polish Economy on Wednesday, 20th of January 2016, at 8:30 AM at the Irish Embassy, which is located on ul Mysia 5, 6th floor. The Chamber thanks Ambassador Keown for hosting the event. Many of you may already know Maciej from previous years, but for those that don’t, he won an award in 2012 from Bloomberg, ranking second in the “most prescient economist in the world”. Entrance will be free for all IPCC Members. Please RSVP to brianmason@irishpolish.pl / 668 519 462 as the numbers of places are limited to attend the breakfast.